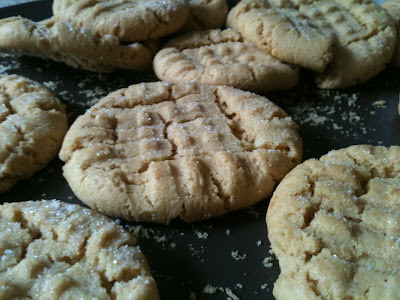 2 1/2 cups GF low sugar, natural peanut butter, almond or sun butter. Preheat oven to 350°F . Beat the egg, sugar, baking soda and vanilla in a standing mixer with the paddle attachment or with a hand-held mixer. Stir in the peanut butter until well blended. Stir in chocolate chips if using. Drop dough by teaspoonfuls onto baking sheet, pressing lightly with the back of a fork to flatten and make pattern . Bake for 8-10 minutes, until just set and slightly brown. Transfer to a wire rack to finish cooling.